Favourite Character: I think it was impossible not to love Kurt this week. I really wasn’t always Kurt’s biggest fan last season but he just tears my heart out repeatedly now – in a good way. The press has been quick to attack the writers for their constant Kurt drama this year though, with many TV bloggers wondering why Glee has become The St. Kurt Show. I definitely agree that the show’s been focusing too strongly on Kurt with not enough development of the other characters, but I do enjoy Kurt’s character arc and think that he was incredibly strong this week in making some very tough decisions. Best Song: How can I choose between “Marry You” and “Just the Way You Are”? Both songs surely helped to catapult Burt and Carole’s wedding on to future “best TV wedding” lists, and although I find the original versions of both songs (both by Bruno Mars) rather annoying and overly sappy, they totally worked in the episode. 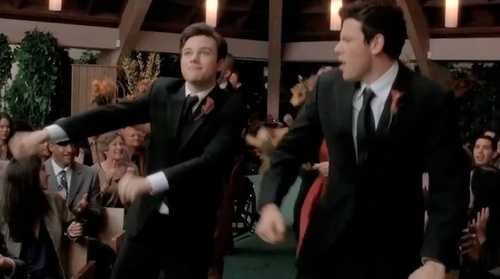 The performance of “Marry You” (clearly an homage to the JK Wedding Entrance Dance) was ridiculously fun, and I love how Finn simultaneously sang “Just the Way You Are” to Kurt, Carole, and Rachel. Too adorable and I teared up way too much. Sue: I just prefer to think of the homeless as outdoorsy. So shine on, urban campers! Sue: I will expel him faster than a Thai takeout place can read back a delivery order. Carole: We wanted the two of you to be the first to know. Finn (to Carole): Somehow without even one in the house, you taught me what it means to be a man. Amazing Guest Star in an Unnecessary and Ridiculous Storyline: Carol Burnett as Sue Sylvester’s Nazi-hunter mother? Genius casting and Burnett totally rocked the role. Unfortunately the storyline was a bust, in my opinion. The mother-daughter duo had a few great moments together but the entire Sue wedding storyline was just pointless. I think that all Glee viewers are well aware that Sue Sylvester is in love with herself and I don’t think she needed a “wedding” to prove it. Although, I will admit that the tracksuit dress was phenomenal. I only hope that they’ll bring Carol Burnett back again in the future and that her plotline will be more worthwhile. Weak Point: Oh, Sam. How far you’ve fallen for me lately! Twice this season I’ve named you my favourite character of the episode (in ﻿“Audition”﻿ and ﻿“Duets”﻿), and now you’re giving a promise ring to a girl you’re not even officially dating? Slow it down, boy, slow it down. Admittedly I did love how Sam stuck up for Kurt against Karofsky in the locker room, but giving Quinn a promise ring? Yuck. And then Quinn later wearing the promise ring? Double yuck. Most Hilarious Reference to Fandom: Back in the first season episode “Bad Reputation”, Rachel mentioned the shipper term “Puckleberry” on-screen, the first time Glee has acknowledged the show’s die-hard fans. Now in “Furt” we have Finn mentioning “Puckleberry”, “Finchel” and, of course, “Furt”. Personally, I prefer “Kinn” as a shipper name for Finn and Kurt, but still, I love how the writers make reference to their own fandom. Next week: Glee goes to Sectionals! And they perform one of my favourite songs! And if it’s anything like last year’s trip to Sectionals, you know there’s going to be Drama with a capital D! I agree with all your comments, the Sue wedding was just in the way, what was Sam thinking??? and love Kurt but I’m ready for someone else to shine. Also, I miss Rachel!!! But she really seems to be maturing which I love! Last year Finn, Rachel, and Quinn got the most time to shine with their Teenage pregnancy season theme. This season, the theme is Bullying, and Kurt’s getting a chance to shine. I don”t mind, because the message is doing a LOT of good. I think people are ignoring that he other cast is NOT getting ignored– they’ve been developing as well. Rachel shows care for Kurt, Finn has now left homophobia and accepted Kurt as his bro. Something between Santana, Finn and Rachel’s gonna come up soon. 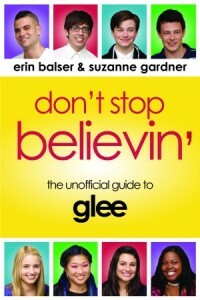 Sam and Quinn are getting time, as well as Brittany and Artie. Mike was the one to start defense for Kurt. The cast is not getting ignored, believe me. I think its just that Kurt’s story holds much more reality and flavor that it ends up being the dominant point at the end. I DON’T want to see Glee being the Rachel and Finn show. That was last year. I’m happy the way it’s going right now, all of them are going through character development. Hi! My first reply. Really like this blog and was hoping for a comment on this esisode. I agree with most of what you’ve said, specially the awesomeness of Sue’s mother, though I’ll agree the storyline was the weakest concerning her I’ve seen on the show. Plus I love Sue’s sister and I feel it’s endearing whenever the writers show their relationship. I also feel like the show is paying tooooo much attention to Kurt. Like you, I didn’t care much for him last season (especially when he was all over Finn and was trying to sabotage Rachel) but he’s grown on me. Still, I think he’s been given too much time on screen, I’d appreciate some attention to other characters. Anyway, congrats on the blog. I’ve never teared so much when watching Glee. This episode is really very touching and I really enjoyed the love between Carole, Burt, Finn and Kurt. 🙂 “we 4 different persons are one family”. From seeing how the two boys hated their dad and their mom being together and seeing them as a family really touched my heart very much. Both “marry you” and “just the way you are” made me tear so much! 🙂 *two thumbs up* for this Furt Episode! Maybe I’m just coloured by my own sense of weddings as a potentially divisive cultural ritual, but I think the role of the Sue Sylvester wedding in this episode was about more than her own character development: as with the episode on faith, the notion here seemed to be about balancing perspectives–pointing out that finding a perfect partner isn’t a de facto outcome in life, and intimating that there are different ways to handle living in a culture where marriage is considered the epitome of human interactions. That said, I just saw a commercial for next week’s episode and my heart began breaking anew for the direction they took with Kurt. I am so angry about the fact that he ran away; and indeed, that all the stars magically aligned to allow him to run away. The message about standing up to bullying in previous episodes was fantastic, but most queer youth don’t have the ability to do what Kurt has done (which was, I thought, the entire reason they had Preppy McCutie point out the two options that existed! ), and so he necessarily becomes less of a productive role model in his new role at prep school. I swear to all heck, the writers better be going somewhere REALLY empowering with this gambit: if Kurt really is “gone; and he’s not coming back” to Hicksville USA for the rest of his high school career I’m going to be crushed. The Kurt story arc is great, but I’m missing the other strong, counterbalancing stories that made Glee so great to being with. There was so many driving narratives last season – the fake pregnancy, the real pregnancy, a bunch of relationships beginning, blossoming and faltering. This season, there’s not even a great sense of anticipation or urgency about sectionals. And while Sue can always be relied upon to be outrageous, her self-wedding this week just fell wide of whatever mark the show was trying to make. There were some nice moments, but I’m beginning to lose the love …. Somehow I think Rachel and Finn need a break this season. Maybe now it’s time for the both of them to find their own selves and not focus on relationships. I think Santana and Finn suit together but Finn probably needs a break from Rachel as she can be really controlling. So far Season 2 has kicked off to a good start. I like how they focus more on the characters rather on Sectionals, no offence. Episode 9, Sectionals has shown quite a lot to me. The last part of the episode where Tina and Mercedes sing “Dog Days Are Over” was the best. (: They all hugged at the very end and to me that potrays the glee characters as part of a family. Quinn has become much more nicer since last season. I don’t know, maybe it’s me but I’ve noticed that since the beginning of Season 2. There’s a much softer look in her eyes. And something tells me that all of them who act in Glee are really natural at acting. ‘Cause in real life they act the same. They act the same in their interviews and I think that’s what makes a great actor. In all of us. Congrats to making this season one of the best ever.